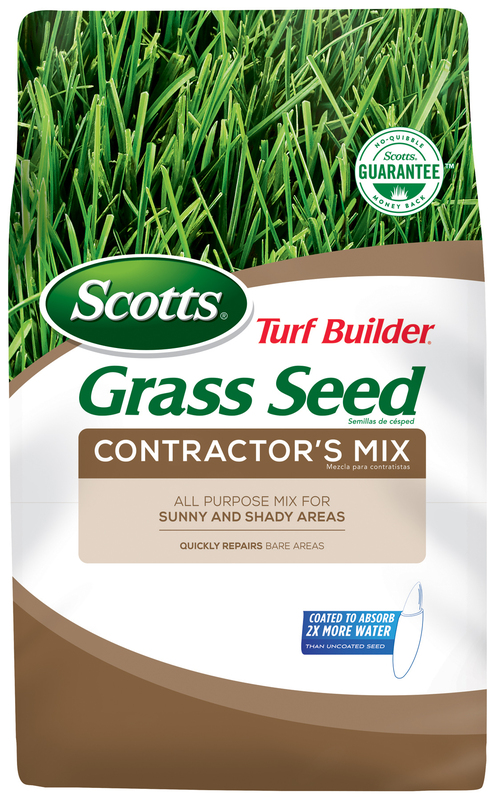 Scotts® Turf Builder® Grass Seed Contractor's Mix is an all-purpose mix for sunny and shady areas. This 99.9% weed free seed has been blended specifically for the Northern region. Just prep the ground, apply the seed and water and in no time at all you'll have a beautiful yard, thanks to Scotts® Turf Builder® Grass Seed Contractor's Mix. 20lb: Up to 8,000 sq. ft. Apply using a Scotts® spreader. Lightly rake the seed into the soil. For best results, apply Scotts® Turf Builder® Starter Food for New Grass when seeding to help new grass grow in quicker and thicker. Seed will begin to grow in 5-10 days. You can mow the seedlings when they reach 3 inches in height. 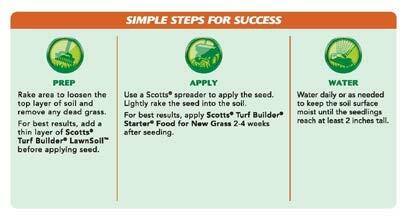 For best results, apply Scotts® Turf Builder® Starter® Food for New Grass when seeding. Do not apply a weed control product until after at least four mowings. - (Turf Builder® Edgeguard Mini, Basic, Standard, Deluxe Edgeguard, Edgeguard DLX, Lawn Pro & Speedy Green) - Set to 5½ for overseeding and 12 ½ for New Lawn. - (AccuGreen, Classic Drop) - Set to 8 ½ for overseeding and 13 ½ for New Lawn and go over lawn twice. - Set to 5 for overseeding and for new lawn, set to 5 and go over lawn three times. - Set to 5 for overseeding and for new lawn, set to 6 and go over lawn twice.